Caroline E. Sapp | Nashville Injury Lawyers The Law Offices of John Day, P.C. Caroline E. Sapp is one of our six attorneys at The Law Offices of John Day, P.C. and has successfully represented hundreds of clients who have been injured across Tennessee. Caroline comes from a long line of legal professionals, which influenced her decision to choose law as a career. Her great-grandfather was a judge and sheriff in White County, Tennessee; her great uncle was a former trial attorney and district attorney in the Upper Cumberland; her grandmother was Clerk and Master in White County for over thirty years; and her aunt is the current Clerk and Master in White County, Tennessee. 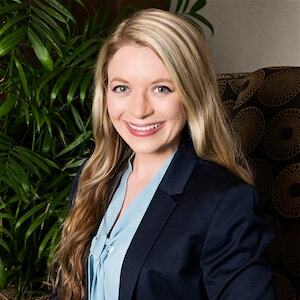 She was named a 2018 Mid-South Super Lawyers Rising Star, and selected as one of the twenty-five members of the 2019 Nashville Bar Foundation Leadership Forum. She is a member of the Nashville Bar Association where she is the Managing Editor and co-chair of the Nashville Bar Journal. In 2016, she was named “Contributor of the Year” for her work on the Journal. She is also a member of the Tennessee Bar Association, Lawyers’ Association for Women, Marion Griffin Chapter, where she serves as chair of the Publicity, Technology, and Social Media Committee, and the Upper Cumberland Young Lawyers Association, where she serves as President Elect / Vice President. Not only is Caroline committed to helping her injured clients, she also is committed to helping others in her community; her community and pro bono activities have included Packs for Pints, an event she spearheaded to benefit foster children in the Upper Cumberland; Lawyers for Littles bowling fundraiser, which benefits Big Brothers Big Sisters of Middle Tennessee; Joint Operation for Veterans, which assists veterans with legal services; Putnam County Schools "Fairy Tales on Trial" Mock Trial Competition; and the Nashville Bar Association’s Sit-In Program where she presented a lesson to students at Hillsboro High School regarding the 1960s lunch counter sit-ins in Nashville. She has also served as a scoring judge for the Tennessee Bar Association’s and Nashville Bar Association's Mock Trial tournaments. While in law school, Caroline served as a Research Assistant to Professor Jodi L. Wilson and interned for the Honorable Bernice B. Donald in the United States Court of Appeals for the Sixth Circuit. She was selected as Editor-in-Chief of the Mental Health Law & Policy Journal, as a Grading Committee Member on the Moot Court Board, one of the three oral advocates on the Wagner Labor and Employment Law Moot Court team, a Student Pupil for the Leo Bearman, Sr. Inn of Court, a student ambassador, and a student orientation leader. When Caroline’s not practicing law, you can find her with her rescued Shetland Sheepdogs, running, and traveling – her favorite travel spots to date include Northern California, the Oregon coast, Washington, Morocco, Greece, Spain, Austria, Germany, Slovakia, and Rock Island State Park. Tennessee Technological University, B.A., M.A.